In times of hardship, pain and loss, many of us attempt to find solutions in the very dunya that caused that calamity to befall us in the first place. We search for temporary comforts in people and worldly objects, all of which have the potential to break us again. Some of us find relief in medication and counselling, some surround themselves with sympathetic ears and some simply lose hope and derail from the path of Islam. However, Allah has provided us with the best tool of all: Prayer. “And seek help through patience and prayer, and indeed, it is difficult except for the humbly submissive [to Allah]“ [Qur’an: Chapter 2, Verse 45]. Allah is the Almighty, the Creator and Sustainer of the universe. So who better to call upon than Him? Who better to seek ease from pain and hardship than Him? “… Unquestionably, by the remembrance of Allah hearts are assured,“ [Qur’an: Chapter 13, Verse 28]. Dr Andrew Newsberg of the University of Pennsylvania attempts to enlighten us with this hidden wisdom. He studied brain wave activity during prayer and found a direct impact on several brain locations. The benefits of prayer are incredible! Regular daily prayers halt the frontal lobe from shrinking with age, which is the part of the brain that regulates our speaking, reading and memory; therefore, this helps prevent memory loss in old age. We need not look further to see that prayer is beneficial for us, making us healthier and happier. It is a healer in and of itself, activating regions of the brain that make us happier and ridding negativity. It is not just a form of worshipping Allah , but also a form of meditation: A self-help tool to bring us to a state of tranquility. The more regular the prayer and the deeper our connection with Allah , the more beneficial it is for us. Our beloved Prophet Muhammad relied on prayer as a source of comfort. As we all know, the Prophet was tested with many trials and tribulations in his time, and it is with prayer that he found mental calmness. The prayer of the Prophet was always with great humbleness, full concentration and sincere submission to the Almighty . This is what is known as the state of khushu’, a state of full awareness of the Almighty as we direct our minds and heart to our Lord alone. “There has certainly been for you in the Messenger of Allah an excellent pattern…” [Qur’an: Chapter 33, Verse 21]. “Certainly will the believers have succeeded: They who are during their prayer humbly submissive…” (Qur’an: Chapter 23, Verses 1-2). This is the state that we should aim to achieve in our prayers. It is in this state that we will find the biggest stimulations in the brain so we may reap the true benefits of prayer, In sha Allah. The Prophet did not only pray at times of need, but would pray in all situations and occasions. He would pray to thank Allah, seek His forgiveness, and ask for His protection and guidance. He would offer prayer for rain, decision-making, before undertaking a journey and even during battles; the list is endless. And, there was not a prayer that he would offer except that, through the mercy of Allah , it brought about some sort of blessing, guidance or ease! How Can We Attain Maximum Benefit From Prayer? As Dr Newberg revealed, prayer performed regularly and with a deep spiritual connection, makes a happier and healthier person. Our Prophet is a perfect example of how and when prayer should be offered. We take from his example four practical steps by which we can gain maximum benefit from prayer: Engage, Connect, Submit and Make Dua. Incorporate prayer into your daily life. We should always focus on improving our relationship with Allah and the best way to do this is to engage in regular prayer. So make prayer your habit. Converse with Allah through your duas and try to connect with Him every day. Remember Him and He will remember you. First and foremost, make sure you pray on time — no matter how busy you are — and do not miss any fardh prayers, especially Fajr. A busy life may make prayer harder, but prayer makes a busy life easier! The five fardh prayers should be our first step if we have not yet already established them daily. Once we have established the fardh prayers, we can move on to incorporating more optional prayers into our daily lives. The more we pray, the better our connection with Allah and the more we can seek the blessings and benefits of prayer. Take time to look into the many prayers that the Prophet taught us to perform and their benefits, and try to incorporate as many as you can in your daily lives. Whether it is in times of need to seek council, or in times of ease to thank Him , you can never call upon Allah too many times. When you stand to pray, remember who you are standing before and humble yourself in His presence. Pray as if it is your last prayer. Imagine Allah standing before you and the angel of death behind you. Know that you are in control of your mind and body. Remain still, focus on the place of sujood and avoid thinking of worldly matters; the time of prayer should be dedicated solely to focusing on your relationship with Allah . So let go of your worries and let yourself indulge in His love and greatness. Reflect and ponder on every ayah that you recite. This will help you concentrate on finding a personal meaning and help prevent your mind from drifting. The more you reflect, the more sincere your prayer will become. Try to set aside time specifically for your prayers. Go to a quiet area, with least distractions possible and truly focus on the prayer alone. If you are praying in congregation, then let the spiritual atmosphere inspire you, not distract you. Do not rush off from the prayer mat when you have finished your prayer. Take some time to reflect, recite the post-prayer duas, embrace the moment of closeness to Allah and know that He is present and listening. 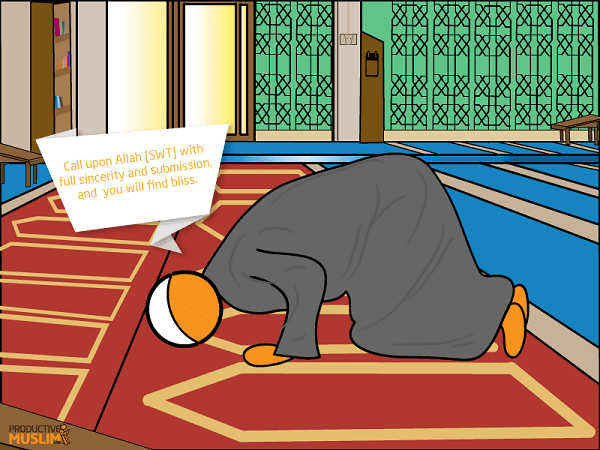 Ibnul Qayyim described sujood as the secret of prayer, the greatest pillar and the seal of the rukoo’. In this position, we can truly submit ourselves to the Almighty . In fact, further to Dr Newberg’s research, Dr. Ahmad Sakr found that the position of sujood is one method scientifically proven to bring peace, tranquility and happiness to the one in prostration . He explains that we are all exposed to electrostatic charges from the atmosphere and ridding ourselves of these extra charges is beneficial to one’s health. The best way to rid these extra electrostatic charges according to Dr Ahmad Sakr, is to prostrate with one’s forehead to the ground. This brings about a calming feeling and dissipates electromagnetic energy. Once again, science enlightens us on the wisdoms behind sujood. Not only do we find ourselves the closest to Allah in this position, but it also physically brings us peace and tranquility. So whenever you are in need of mental calmness, follow the footsteps of the Prophet and prostrate to the Almighty . It is also the best time for us to make dua, as here, we are the closest to Allah . I need not say more. Make dua, and trust in Allah , for He knows what is best for you. Remember that Allah alone is sufficient for us and through worshipping the Almighty with sincere submission, our hearts will find peace In sha Allah. Trust in Him and have faith that He will always answer your prayers. “And when My servants ask you, [O Muhammad], concerning Me — indeed I am near. I respond to the invocation of the supplicant when he calls upon Me. So let them respond to Me [by obedience] and believe in Me that they may be [rightly] guided” [Qur’an: Chapter 2, Verse 186]. “For indeed, with hardship [will be] ease.” [Qur’an: Chapter 94, Verse 5]. Whether you take it from science or take it from our beautiful religion, call upon Allah with full sincerity and submission, and you will find bliss, In sha Allah. Has this article been beneficial to you? I would love to hear about your experiences; how has prayer helped you through your hardships? What helps you gain khushu’ in your prayers? Please share your thoughts below! Newberg, Andrew B.; Waldman, Mark Robert (2009). How God Changes Your Brain. Sakr, Ahmad H. (1997). Sujood (Prostration). Saadia recently graduated with a BSc in Psychology and has a healthy background working in this field. As a student of Islam, she aims to utilise her degree to its true depth by focusing on interlinking Islam with psychology. Her passion in writing is inspired by the beautiful harmonisation between the two.